In February, Hubbard, at last recovering from his illness, had turned his attention back to the worldwide Scientology scene. The CMO did a statistical analysis for him. How many people were receiving auditing and training? How much money was being made? How many new people were coming into Scientology? Hubbard did not like what he saw. The number of active Scientologists was diminishing, as was the amount of money being made. Students were abandoning their courses and demanding refunds. The obvious reasons were the twenty-fold increase in prices since November 1976, and revelations in the media about the Guardian's Office. Hubbard ignored the obvious however, and issued the "Change the Civilization Eval[uation]." 3 The Guardian's Office had let him down, and so had Sea Org management. The Commodore's Messenger Organization had been concerned with Hubbard's personal welfare, and with his personal projects (the films, for instance). Now they seemed to him to be the remaining loyal unit of his private army, and they were to enforce his will upon the renegades. Hubbard reprimanded the CMO for issuing orders under their own title. Hubbard must not be seen to be managing Scientology under any circumstances. The pretence of his resignation from Church management in 1966 had to be rigorously maintained. Otherwise he would be wide open to the extensive litigation against Scientology. Worst of all, he was implicated in the case against his wife and her cohorts in the Guardian's Office, and he too might be indicted. He had already been named (along with twenty-nine others) as an as yet unindicted coconspirator. The CMO were a latter-day Praetorian Guard, at first protecting and serving the whims of their Emperor, but gradually becoming the most powerful element in the hierarchy of command. Long the interface between Hubbard and the rest of the Church, part of the CMO became the senior management body: the Commodore's Messenger Organization International, or CMO Int. But as the Commodore's Messenger Organization was quite obviously connected to the Commodore, they had to find a new title. So the Watchdog Committee (WDC) came into being, in April 1979. It consisted solely of the senior executives of CMO Int. The function of WDC was to "put senior management back on post." They did this by absorbing all top management posts. The members of the Watchdog Committee remained anonymous, and many Scientologists thought Hubbard was in fact the mysterious Chairman WDC. Hubbard's orders grew progressively more wild. Gerald Armstrong was in the CMO at Gilman: "In the summer of 1979, on the orders of Hubbard . . . I became involved in a project to build Mr. Hubbard a completely new house near Hemet. I was personally involved with the architectural plans for this property and saw an order from Mr. Hubbard to have built around the property a high block wall with openings for gun emplacements." Amongst Hubbard's requirements were that the house be "in a nonblack area, dust-free, defensible, with no surrounding higher areas, and built on bedrock." In September 1979, nine of the indicted GO executives and staff, led by Mary Sue Hubbard, signed a stipulation admitting their involvement in the break ins, burglaries, thefts and buggings. By their admissions they stopped further investigation into their numerous other misdeeds. They also avoided a drawn out trial with the inevitable adverse publicity. The 282 page stipulation revealed the story of the infiltration of government agencies, in startling detail. In December, the GO nine were sentenced. Agent Sharon Thomas received the shortest prison term--six months. The others, including Mary Sue Hubbard, were sentenced to four and five year terms. They managed to stall the day by appealing the sentences. Hubbard went on to make it perfectly clear that he held out very little hope for the world. There was going to be a nuclear war very, very soon. He confidently asserted that "those who have a full and complete Purification Rundown will survive where others not so fortunate won't. And that poses the interesting probability that only Scientologists will be functioning in areas experiencing heavy fallout in an Atomic War." In fact, Hubbard's "Personal Communicator" visited several principal Sea Org executives and told them that if they did not raise Scientology's stats by 540 percent in six months, then the world would end. They did not, and it did not, and in later reissues the phrase quoted above was changed to "those who have had a full and complete Purification Rundown could fare better than others not so fortunate. And that poses the interesting probability that only Scientologists will have had the spiritual gain that would enable them to function in areas experiencing heavy fallout in an Atomic War." At about the time that the "Purification Rundown and Atomic War" was invoked in an effort to galvanize Scientologists into action, the GO predicted an FBI raid on the Gilman complex. It seemed likely that Hubbard would be indicted either by a New York grand jury investigating Scientology harassment of author Paulette Cooper, or a Florida grand jury investigating Scientology's dealings in Clearwater. There was a panic at Gilman Hot Springs to remove any material demonstrating Hubbard's management of Scientology. A massive document shredder was moved to Gilman Hot Springs. The crew affectionately called it "Jaws." Anything which connected Hubbard to the La Quinta or Gilman properties, or to the Guardian's Office; any order, or anything even resembling an order from Hubbard had to go, and accordingly tens of thousands of documents were shredded. The Messenger logs, which were the painstaking record of every verbal order given by the Commodore to his Messengers, were buried for safe keeping. 7 These logs have never come under public scrutiny. At last an accurate and fully documented account of the remarkable exploits of the Founder would be possible. The fabrications of conspiring government agencies could be disproved once and for all. Armstrong sent a request to Hubbard asking permission to establish an archive with this material at its core. Hubbard granted the request. The process eventually discredited Hubbard's fictional autobiography for good. Shortly thereafter in February or March 1980, Hubbard hightailed it out of his apartment in Hemet, with the two Messengers who were "on Watch," Pat and Annie Broeker. 9 The Broekers had been in Scientology for a long time. Annie had been a Messenger on the ship. Hubbard disappeared without trace. He probably left because of the strong possibility that he would be subpoenaed by the Paulette Cooper grand jury in New York. MCCS started an eddy which would become a tidal wave, sweeping away the majority of veteran Scientologists. The entire corporate structure was to be changed in a desperate attempt to avoid the consequences of Guardian's Office activities, and the ensuing concerted legal action against the corporate entity of which it was part, the Church of Scientology of California, the corporate heads of which were GO executives. Hubbard dabbled with a follow-up to the Purification Rundown, called the Survival Rundown, but most of the work was done by his Technical Compilations Unit at Gilman Hot Springs. After lengthy surveys, the new Rundown was released with illustrations of an American Indian paddling a canoe, or loosing an arrow at a buffalo. Unfortunate choices as examples of survival. The "Purif" had been advertised with a waterfall, unintentionally suggesting an ad for menthol cigarettes. On July 16, 1980, the GO, which had precious little to celebrate, was able to rejoice with the news that the British government's use of the Aliens Act against Scientology was finally over. 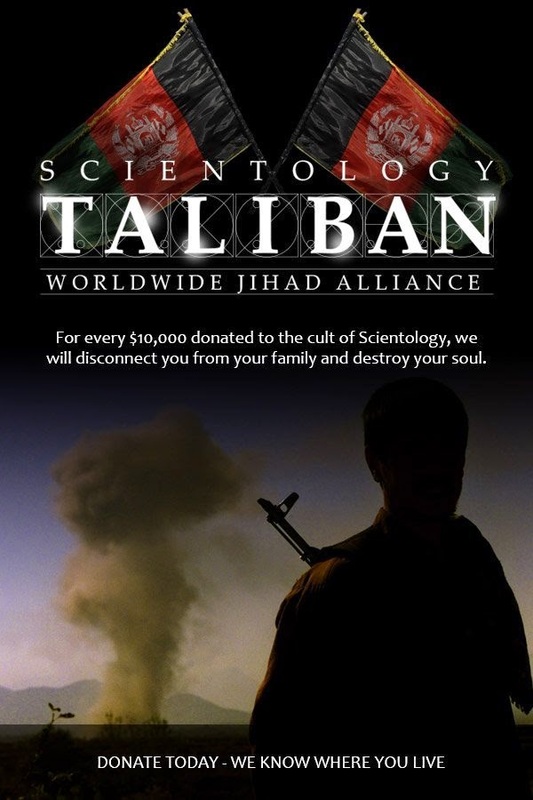 After twelve years, foreign Scientologists could once more enter Britain legally. However, the restrictions on Hubbard's re-entry were not lifted. Hubbard was beginning to let slip clues to the terrible truth of the OT levels. He issued a Bulletin called "The Nature of a Being" in which he quite publicly, yet mystifyingly, declared that "a human being . . . is not a single unit being." 12 Plans were underway to film Revolt in the Stars, volcanic eruptions and all. Hubbard itched to make OT 3 public.